On December 19th some Cloud9 choristers lent their voices to bring “Let It Go!” to patients and staff at St Vincent’s Hospital, Melbourne. We were part of a pop-up choir of some 50 choral voices and some staff from St Vincent’s and pulled together by Ben Leske, himself a survivor of brain cancer thanks to St V’s. What made our afternoon even more special was the presence of both Michael Leunig whose poem and artwork in turn inspired Suzann Frisk to put it to music. Many of you will know that Cloud9 closes its concerts with “Let It Go!” which we’ve done since Ben Leske taught us the song some four years ago. The poem and music gave Ben a way of coping with all that faced him. It has a similar effect on many others when they hear it. “Let it go, let it out, let it all unravel. A path on which to travel”. 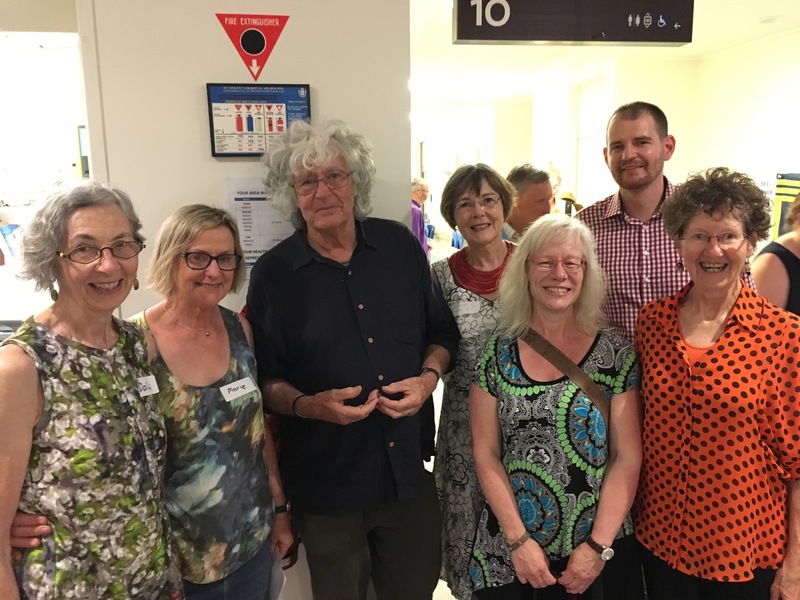 Michael Leunig (3rd from left), Suzann Frisk (second from right) and Ben Leske, (the tall one) with Cloud9 singers Marie, Janice, Dale and Denise. Categories: Cloud9, Performance | Permalink.